Steve Mepsted: Hello, my name is Steve Mepsted and I’m here talking with Philip Castle, I am here to talk with Philip about his life and work, but before we go back into history, I gather you have some work to do for gallery exhibitions coming up in the near future Philip? 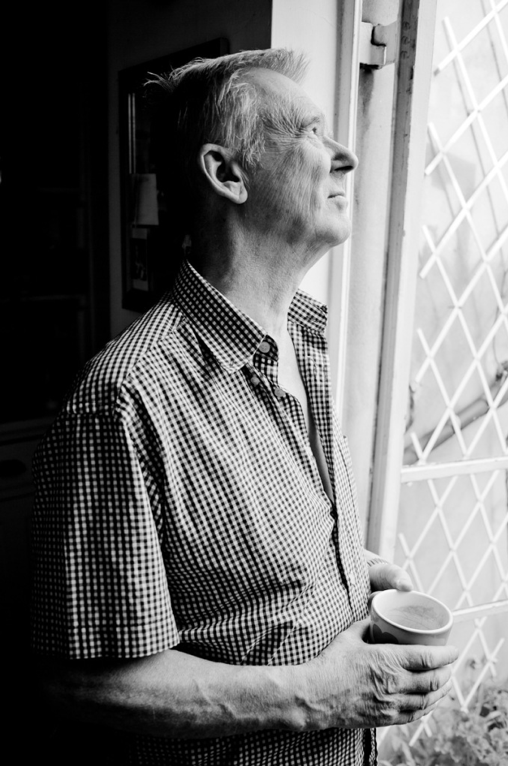 Philip Castle: Two galleries are interested and both have approached me. I feel both will come off. I think the show related to ‘Clockwork Orange’ will be this year and the other show will be the end of next year. So if there is any more work to be done, it will be for the second one. The first one will be my archive material of ‘Clockwork Orange’, plus some prints which are to sell. There will be a fuller, greatest hits style exhibition, which will be dotted around and will fill out more about me than just ‘Clockwork Orange’. SM: It must have been a thrill to get that first phone call from Stanley Kubrick? PC: Well my two favourite films at the time were 2001 A Space Odyssey and Dr. Strangelove. Dr. Strangelove is possibly one of my favourite, top-ten films. Just to hear that Stanley Kubrick was interested in me doing these posters, well…there was no question that that would be the case obviously! PC: He (Kubrick) rang me and said do I know anyone who could do a painting like Ben Shahn? I think its Ben Shahn? Stanley had this idea for a poster for ‘Full Metal Jacket’ and would like to see this helmet done in the style of Ben Shahn. PC: I said I didn’t actually know anyone who could do that, but I’m an Illustrator and why don’t you let me have a go? His first concern was it had to work in black and white. He said anybody could make things look good in colour but its got to be one column in the Evening Standard and its got to really hit you. So I did it (the helmet) as though it had just been left on a desk, flat, and I don’t know who had the idea, but just tilting it made a whole difference – put life into it. SM: Like on a head? PC: Yes, exactly, and there you go. PC: Have you seen that (alternative poster) before? SM: No, I’ve never seen that. 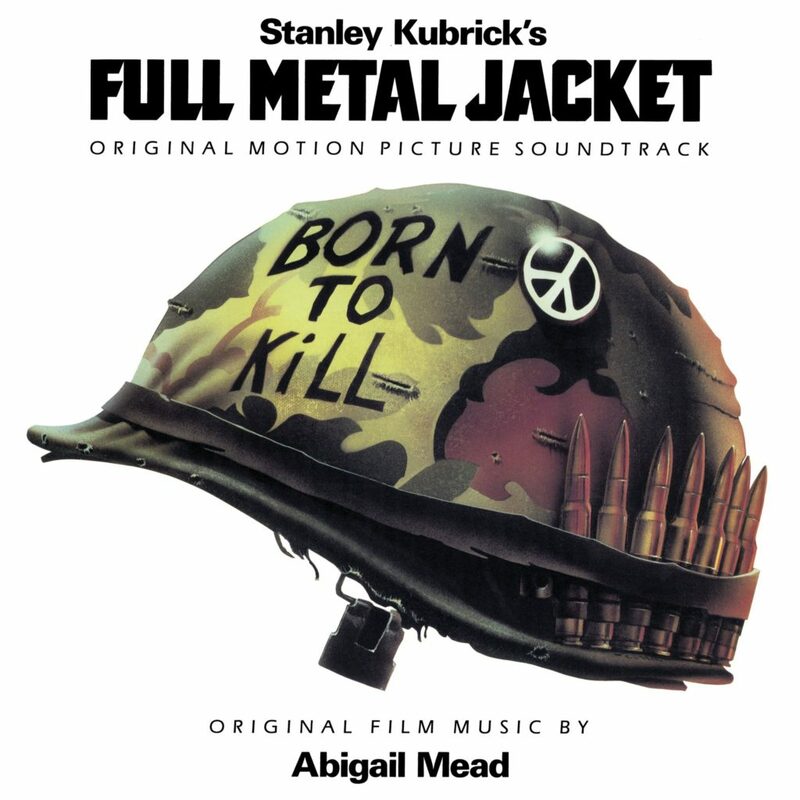 It’s wonderful to discover because the helmet is the iconic image for ‘Full Metal Jacket’ it’s very unusual to see something like that. PC: I think that some of us had in mind that for certain regions the helmet might be too provocative. SM: I don’t think many people would have seen this will they? PC: No hardly anyone, Jennifer, my wife, last night said, “I’ve never seen this before, when did you do that?” Now…I’ve got another box of Kubrick stuff, just hang on a minute. Philip goes off somewhere in the house and returns with a battered cardboard box, putting it on the table. I am very surprised and excited to see a G.I. helmet sitting in the box. SM: Wow, is this..? So we’re seeing “The Helmet”? SM: No, but there is something on it… Ah, do you know whose helmet that is? It’s ‘Animal Mother’s’. PC: Yes, you wouldn’t want to go to war in that thing would you? Imagine all of it. They’ve got all the guns and knives and bayonets, and more shells, and then they’ve got armour-plated vests and then they’re expected to run six miles or something! So no wonder they were ‘Born to Kill’! You’d feel like it wouldn’t you? SM: And Stanley sent this helmet to you? PC: Yes, on one of my visits he would hand it over and I just brought it back. SM: And you’ve still got it! PC: Yes, but I see the peace badge has gone, I think I took it off for another job and never replaced it. It’s in the house somewhere. Now here’s a shot for you! (Philip puts the helmet on his head)…Its too big for me, any hat is big for me. SM: Yes, just that little tilt makes a massive difference. Was that your suggestion or Stanley’s? PC: I’m not sure, I can’t remember. PC: Yes that’s right, I would call and say I’ve got something to show you or he would have said well come back next Tuesday and I’d bring this or that. SM: So he was quite a free and easy person to work with? PC: Yes, he was very professional, we only talked about business, I don’t think we would chit-chat about the state of the world. SM: Now this! (Referring to a cinema lobby board without any text on it) I love this, it’s so impactful. PC: No me neither – I never really got it. PC: But, the finish on the bullets…I wanted to get them much more realistic than they are. I’m not really happy with them. SM: Yes (referring to the cinema lobby board) this is muted and in the finished poster they are much more brassy. SM: Of course, because that would be very hard to airbrush! PC: Yes I would have had to do it by hand and it would have been hopeless. SM: Did you like the film? PC: I did, yes. It was beautifully shot, as it would be if Stanley had done it, but I’m not a fan of G.I. war movies. They put four buddies in a foxhole and make a whole movie out of it. Then planes and shells go overhead, with sweat and drama – I don’t get much from that to be honest. I like war films, but I like them with aeroplanes, as you can imagine. I thought it was interesting how it was built up. He made the action scenes look gorgeous. And the boot camp! It was excellent. I’ve got it in all forms: Video, DVD and of course it’s on the TV a lot. I’ve seen it one time and I don’t think I’ve seen the whole thing more than once. But I may go back and have a look at it. SM: How did it make you feel when you saw that helmet in the film? PC: Well, I was kind of interested, to see if my helmet would appear. It does attach you to the action. PC: Yes, Here’s the hand for “A Clockwork Orange”. That’s the only original artwork that exists, that’s not been shown. This notebook is what I took into the first showing of the movie. I went up to his house, called “The Chantry” I remember, and he had a viewing theatre, it was a rough cut, I don’t think there was any sound, maybe some sound, but there were no titles or anything, and I had this on my knee and I sketched things in here pertaining to the film. So these are my first ideas as to how it might come out. And these were done in the dark of course! I was obviously struck by the rude bits! So I would sketch these things and then go home and draw on top of the sketch and develop it. PC: I don’t think I have met him. I have seen him on many occasions, but never had a formal introduction, He’s a great friend of Mike Kaplan’s (Kubrick’s long term marketing man at Warner Bros.) they’re great buddies, but we’ve never been togther in the right place at the same time so I can’t say I’ve met him yet. Were both form Yorkshire and our age is close. PC: Nothing to do with me of course, but it’s lovely the way they have reproduced the film inside. I showed this to Stanley! He liked it. And this is the Evening Standard of the day, advertising the film. I see pieces of layout paper where Philip has drawn the Clockwork Orange logo, the typeface in different languages, obviously for different territories…Spanish, Italian. SM: It’s amazing that none of this has been seen! PC: Well, I guess absolutely no interest or reason to show it. SM: So again you didn’t fax things to him, you’d actually go round and visit him? PC: I would visit him, I like to actually put the drawing in front of them and discuss it. It was a big deal for me and I wanted not to blow it! But I would do that for any client, I like that, it’s great to take your work with you and get the ‘oohs’ and the ‘aahs’ at the end. Otherwise, if that were taken away, it would be like a rat on a treadmill. This work can be very boring. The highs are getting the job in the first place. Designing it is terrific and finishing it off is terrific, when you have got it as you want it. But the process in between is long-winded and laborious. It takes a long time and you actually can’t do anything else, you work most of the night, then you get up again in the morning and get on with it. I don’t miss all the deadline business. I like not having it. SM: Occasionally you’ll see the name ‘Bill Gold’ (Bill Gold was the head of advertising at Warner Bros. and an Illustrator with hundreds of film posters to his credit) attached to the design of “A Clockwork Orange”, can you talk about that? PC: Somehow Bill Gold got involved and put his name on it, which is a bone of contention for me. Earlier this year he had a show containing some of his fine posters, but he also included Clockwork Orange and took credit for his involvement. But he had nothing to do with it. This upset Mike Kaplin too, who then wrote a letter to all the people who published it as Bill Gold’s work, to change the information. PC: Bill Gold was in charge of the studios where they did the posters and the credits and the titling. Well, they altered my lettering and this rankled me at the time. But I had no power, I know. SM: Often that’s a way of getting around copyright, to slightly readjust or alter a design. SM: You’ve flattened off (the bottom) of the “R’ and the “N” and they have made them into a sans serif. PC: I’d been doing that sort of blocking-in lettering and if anything it was based on Milton Glazer, not that I would consciously copy! But it was easy to do it (the lettering) and when I did this poster I put it in the album and it stuck! But I have never thought of myself as a letterer. SM: Didn’t you enjoy the lettering? PC: Well its meticulous isn’t it. This lettering is ‘out of this world’, its futuristic, its not beautifully finished type. It’s got a certain drawn quality to it, even though it’s cleaned up. It just fits the movie I think. SM: ‘Nutty Ideas’…Is that what he’s saying? PC: Yes. With Clockwork Orange he wanted the bowler hat right, so that’s why they sent me the hat – to get that curve correct. And that was the only thing that they had an objection to, once they’d agreed he and Mike Kaplin, and Julian Senior from Warner Bros. went for it. Stanley would have had the last word obviously. I just did it then, and it worked. I’d done all these sketches in this drawing pad and it just worked out. Naturally, I am immensely proud of these two key Kubrick posters: ‘Clockwork Orange’ and ‘Full Metal Jacket’, but I’ve never thought they were my best work. SM: Do you use computers in your work? PC: I have a Mac and I have used Photoshop – I absolutely love it, I adore it! But it has put me out of work. The only difference (between using a computer and his airbrush work) would be my eye and my design sense and its own requirements. As my equipment is not very sophisticated; its getting a bit old now, I’m not making any money on computer graphics. I’m just not fluent enough in producing works on a computer. Nowadays you can see aeroplane pictures, which are just mind-blowing. They’re just fantastic, they’re dead accurate, they’re well-constructed graphically and I’m so impressed I almost sit down and say ‘well – forget it’. I would love to be in that position where I was doing a job and would get models and I could certainly work on it and make an exciting picture, I know I could do it, but I haven’t done it and until you have an example you can only claim you can do it. I just cant get myself together enough to learn the ropes, there seem to be so many ropes involved. SM: Well, there’s still time. PC: Well, I guess so yeah! The people who are hiring now are getting their own age group; they’re not inserted in an old fart! I work by hand and they would think I was so expensive they wouldn’t be interested. You’ve got to put yourself up and say I’m available and I should get myself together and do that, I know, I realize that, but I am enjoying not doing things. SM: Do you have an agent? PC: No, I’ve had loads of agents, I went along time without an agent and then when things got a bit more difficult I did have (one) but I find that they get you work for maybe a couple of jobs and then they lose interest because they cant point you in a certain direction. You know, they just don’t seem to stick. SM: Well. All I can say is that I think your achievements are manifest in those posters and album covers, you’ve done work that a lot of other Graphic Designers and Illustrators admire; up and coming designers and young people interested in illustrating know about your work and appreciate it. I would certainly say that you’ve got a bit of a legacy going on. PC: Yeah, people keep saying well you know you should have a website, they say, ‘we’d like to do a website and put it all together for you’, and that would be great, but like a lot of things, they just fade away. I’ve enjoyed these terrific exciting projects to work on and I was very pleased to get any film work The Kubrick legacy greets me wherever I go and so I’m eternally grateful. It’s fantastic because its opened a lot of doors, people treat me with respect. I’ve had recent goes at film posters for Warner’s but its difficult. I knew how to talk to people like Julian Senior and Stanley and Mike Kaplan but things have moved on in thirty years. Philip was given a commission to design a poster for “Barry Lyndon”. It didn’t come off in the end. There are two main poster for “Barry Lyndon” – one designed by the French poster designer Jouineau Bourduge with its Saul Bass inspired illustration and American artist and illustrator Charles Gehm had created a highly detailed alternative poster, which is a monumental work in its intricacy. This part of our discussion is included as it is revealing about Castle’s design methods and Kubrick’s need for a concept, which he could latch onto quickly, and feel confident in representing his vision. PC: For Barry Lyndon I was still in the ideas stage. We hadn’t established a hard finished thing which I would have worked up and made a decent shot of. It never actually reached that stage, he (Kubrick) was not content with what I’d produced and I think he’d got someone else working on it and I think they just went with the other people. I’ve seen several different ones and I don’t know which was the main image for it…a sort of floral…? PC: So I went to the library and they didn’t have it in stock; they had to go to the vaults to find it. Well, I read the book and it was smashing, it was super funny. It’s funny in the same way Clockwork Orange is funny. It’s got jokes in it and is written with an Irish humour. He’s very much a lad on the make. But somehow that doesn’t come across in the movie. The film is beautiful; each scene is like a master painting. SM: So your reading of the book gave you ideas; you imagined the characters completely? PC: Yes, but I got a note (from Kubrick) saying ‘Philip I’ve been thinking that you have not put enough time into these (sketches), it looks as though you did them half an hour before you arrived’. Which actually was the truth! But the point about it was that I didn’t do finished work; because I did suggestions and because I could talk about it with the client and say this is what will happen, this is what I want to do, and then I’ll take it a stage further. But he was jumping the gun, they often get other glossy overlaid design from a studio, as that’s how they produced them to make them look fantastic, but I trust that the person I am talking to – and he (Kubrick) in particular would know what I’m capable of and know that things will come together. I have got that note somewhere. SM: But he did have faith in you? PC: Oh yes. I don’t know why he would have written that note to me because he would know that it would come right in the end. SM: But ironically what he said was true! You had done them half an hour before you met. PC: Well it was something near that! But as I said: I had several ideas but would not develop them too far, just to set him off, to get him thinking in a certain way, that’s how I work, that’s how I would get the ideas over. SM: Did you experience his particular brand of ‘obsessive-ness’, which is so talked about, other than what you have just described to me. PC: No, I wouldn’t say he was an unreasonable man. SM: You designed for a David Bowie album didn’t you? 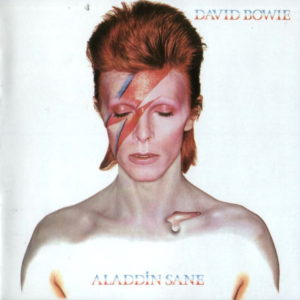 PC: I did a little bit on the ‘Alladin Sane’ album. I did a teardrop in his (Bowie’s) clavicle. 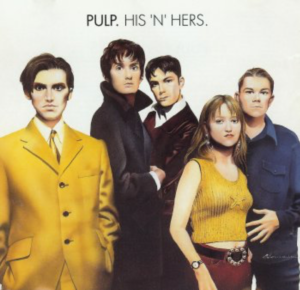 PC: ‘Pulp’ used this for an album cover or it may have been a seven-inch – I mean a CD cover. Philip shows me a small black and white photograph of Jack Nicholson. SM: Did you take that? Is that your shot? 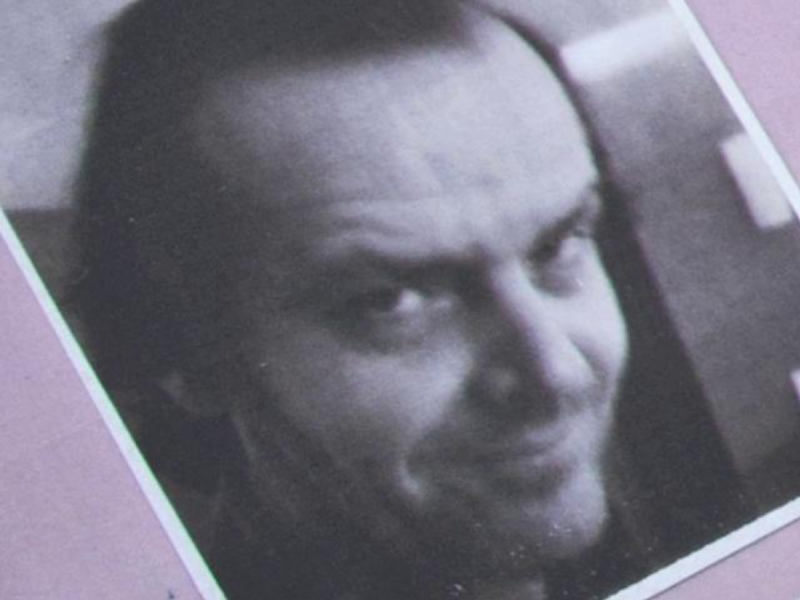 PC: Yes: l did a poster for ‘Goin’ South’ (a Jack Nicholson Directed film, 1978) it was taken during the filming for ‘The Shining’ so that’s why he’s in that shirt, the one he wears in the film. SM: He’s got that look! The eyebrows! PC: He’s very nice. He’s just exactly as you see him in the movies. There’s no acting involved to be honest, he just comes on and is himself! Philip loves aeroplanes and this is evident in his designs for the RAF’s ‘Air Tattoo’ shows. He shows me a design on a banner hung in his home. 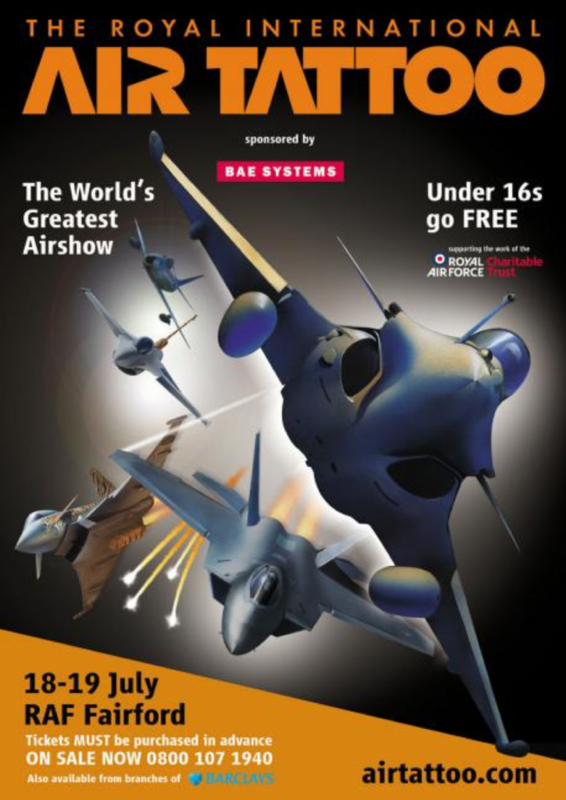 Air Tattoo poster – Phillip loves aeroplanes and is regularly commissioned to create these posters. PC: This is one of my RAF posters done in 2008. I did three, I did ’07 ‘08 and ’09. 2007 was a big success! SM: I’m heartened to hear that people still want to hire Illustrators, because there’s so much photographic work out there being used as the main image. PC: Yes, it’s hard; it’s very hard now. I think you have to be quirky because what I do has more or less been taken over by anybody who has Photoshop. You just put some photographs together and put some crazy writing on it and you’re away. SM: What piece of work do you feel most proud of? PC: Naturally, I am immensely proud of these two key Kubrick posters ‘Clockwork Orange’ and ‘Full Metal Jacket’, but I’ve never thought they were my best work. I think one of my Air Show posters the first one I did in ’67 I liked very much , that was something I really put my heart and soul into. And I did an Elvis, I don’t know if your’re familiar with it but it’s a ‘half man-half jukebox’ design and it was very early on in my career. SM: Did you go to Art College or were you self-taught? PC: Yeah, people keep saying well you know you should have a website, they say, ‘we’d like to do a website and put it all together for you’, and that would be great, but like a lot of things, they just fade away. SM: Do you have anything else you would like to add before we close? PC: Well I’ve enjoyed these terrific exciting projects to work on and I was very pleased to get any film work The Kubrick legacy greets me wherever I go and so I’m eternally grateful. It’s fantastic because its opened a lot of doors, people treat me with respect. I’ve had recent goes at film posters for Warner’s but its difficult. I knew how to talk to people like Julian Senior and Stanley and Mike Kaplan but things have moved on in thirty years. 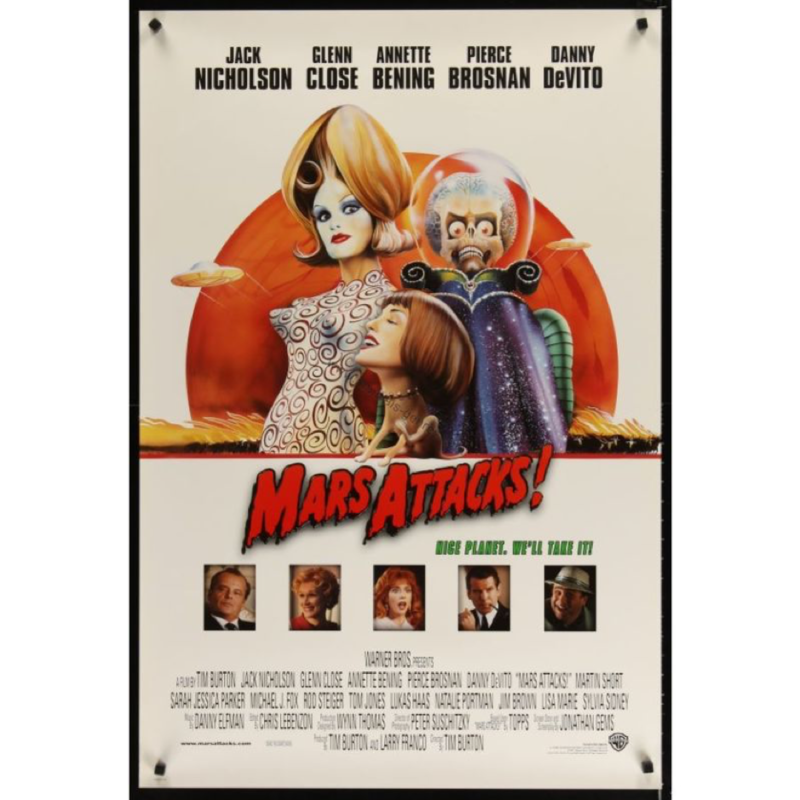 I did ‘Mars Attacks’ and that worked out, I did production work on two other films, one was ‘Analyse This’ and the other film was a film about a hairdresser, a wonderful English film and it was completely thrown away, it has been on television and it’s really funny and a great film, I had real hopes for it and I cant remember what the title was. Oh! “The Big Tease” it was called. I would supply these drawings and they couldn’t understand them and were not interested in them so it died, but I can recommend the film itself. “Analyse This” is funny – its not a bad film at all! But I didn’t do the poster for it, I got as far as producing ideas. SM: Yes, because I remember the poster for that being a photograph or a still from the film. PC: Well a lot of them are photographs now and it makes a lot of sense to me. It’s a shame though – some great film posters have been illustrations by hand but when it’s a photograph the results are, well…photographic; people can recognise the star. Now with Photoshop they can do fantastic things to enhance pictures. I think there’s been some really super posters come out – often for lousy or poor films – but with lovely posters! There’s so many, I mean there must be half a dozen a week, at least, when you think at the end of the year how many that gleans. Over ten or twenty years that’s a fantastic amount of material, a fantastic amount of designs. PC: A rotten film is “Gone in 60 Seconds” but the poster is super! When you went to the pictures you’d pick up what used to be the ABC film review, it’s now some sort of glossy thing but it has all these posters in it and I thought, that’s beautiful! And then you go and see the film and it’s a flat thing and it’s gross. Not always, but you know. SM: I’ve got “Gone in 60 Seconds” in my head and it is a good poster. PC: Yes its beautiful – its really great, I was really ‘moved’ by it (laughing) But the film itself is tedious. SM: Well, Philip. I cant thank you enough, its been absolutely fascinating talking with you and I never expected to see some original art work. Thanks so much – it’s been an absolute joy for me.